This series is a collaboration between the Leviza Lazer and Addiction Recovery Care to report on men and women’s struggles as they went from active-addiction to abundant-recovery. With half of its 400+ employees in recovery from substance use disorder, Addiction Recovery Care (ARC), Inc. is leading the way in Appalachia when it comes to combining drug treatment and vocational training that results in second chance employment. Roughly one-third of ARC’s approximately 450 employees are graduates of an ARC treatment program. ARC believes that the solution to the nation’s workforce issues is lying dormant in the lives of those who are struggling with addiction or alcoholism. 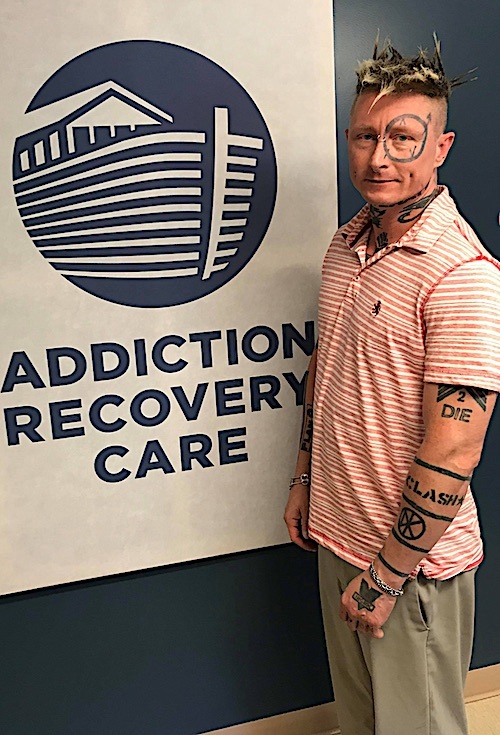 At Addiction Recovery Care, it’s hard to know when treatment for years of addiction will start to turn a patient’s life around. There’s a saying that the goal of early care is to keep patients around “long enough for the miracle to happen.” They happen daily, but not always quickly. For Joe Waugh, the miracle was slow in coming. The native of Mansfield, Ohio spent nearly 29 years in active-addiction, becoming addicted by age 15. Over time, he became an IV drug user and his drug of choice was heroin. If he couldn’t get that, he’ll tell you, he settled for “anything else I could put in a spoon”. Joe says, “I turned into the very thing I hated, a dirty needle junkie.” During that period of his life, Joe had more than one chance to get clean, but it just didn’t happen. It doubtless seemed to many that Joe was too far gone for help. Still, there was something that kept him hanging around, waiting on that miracle. “When I was released from prison February 1, 2017, I signed an interstate contract to transfer my parole to Seattle Washington. My transfer was denied. I tried everything to get out of Louisa, but something wanted me to stay right here. I wanted to get away from Louisa as soon as possible.” Unbeknownst to Joe, the miracle was on its way. In October, 2017, Joe entered Addiction Recovery Care’s (ARC) outpatient clinic in downtown Louisa. Over a period of months, treatment turned into opportunity. He found medical care and learned how to live without drugs. He entered the Peer Support Specialist Academy (PSSA) – a partnership between ARC, Sullivan University, Shaping Our Appalachian Region (SOAR)and the East Kentucky Concentrated Employment Program (EKCEP). There’s a misunderstanding in society that addicts don’t want to stop because using is fun. But the simple truth is that they just can’t. The drugs have taken over and rewired their bodies to crave more, regardless of most hurt it causes. “Addiction can be summed up in one word…loss,” Joe says. What an inspiring story! God does work miracles, we just have to be willing vessels. So thankful you have turned your life around. God bless. I want to congratulate you sir. I remember you back in the day, and always thought your appearance was not only creative, but a road map to the path you were on. Glory be to God, that he reached into hell and pulled you out, and uses you daily to help others. My son spent 12 years in and out of the pen, and was all but dead, but is now a recovering addict, and life is beautiful to him. I list my second oldest on Sept 16, 2015 to an OD of fentenayl. My 3rd is currently in Webster Co. jail. My continued prayers will be with you sir. I was so glad to read this story about Joe! Miracles do happen and I thank God. I pray that he will inspire other addicts to become sober with the help of God and the people dedicated to helping them. I think it’s amazing. You have really done it. Some can only hope for this. ARC is different. They really care and try to help at least in my experience. I’m a recovering addict myself, I’m proud to say I have been off drugs a little over 2yrs. So what I was wanting to know is how can I get a job with Addiction Recovery Care? Please let me know, I would love to help others.